I do love meatless meals from time to time; I’m certainly not adverse to mock (fake) meat either. I pretty much enjoy it all — tofu, tempeh, seitan, etc. I’ve had each of them prepared in a variety of ways: in stir-fries, on sandwiches, in salads, to name a few. 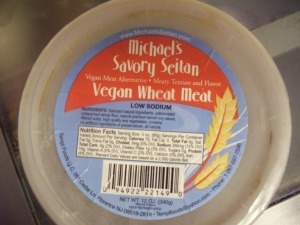 When I was asked to sample and write about Michael’s Savory Seitan Vegan Meat Alternative, I was more than game. I was legitimately intrigued.